On-demand movies on personal TVs, WiFi, full recline seats, meals and a bus attendant call button – almost better than flying! 22- hours in a bus wasn’t as bad as it sounded; we were very glad we decided to splurge on the fancy bus. After spending the past month and a half in less touristy Colombia and Northern Peru, arriving in Cusco was a bit of a culture shock. 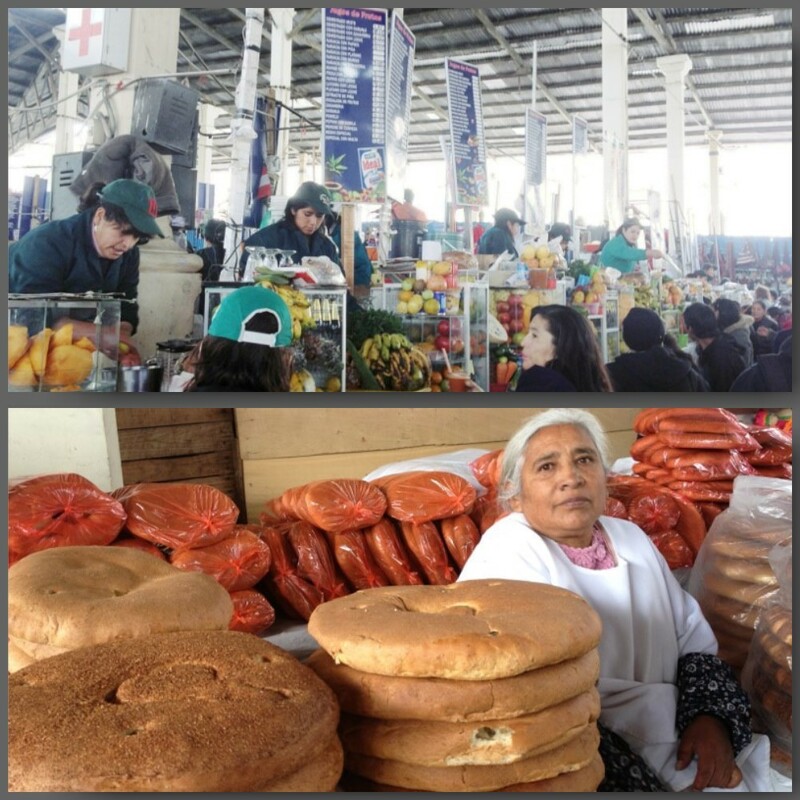 Near the Plaza Del Armas, we heard more English than Spanish and all the food/hotel/goods were almost double the price vs. our previous destinations. Even during low season, Machu Picchu tickets sell out several days in advance so our first task was to buy tickets for Friday. We arrived on a Sunday, so we had several days to make the journey to Machu. 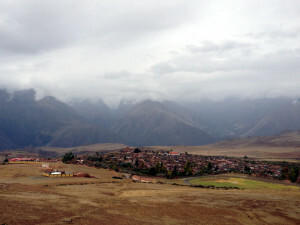 Hike the Inca Trail (or alternative trails) – we weren’t that keen on going on a guided tour. 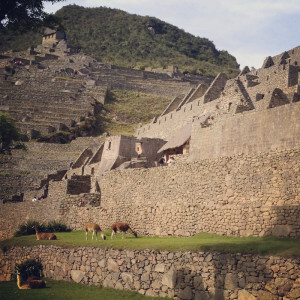 Plus, the Inca Trail sells out months in advance so not ideal for our plan-as-we-go travel. 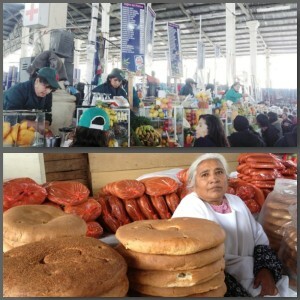 Train route – Train to Aguas Caliente and from there either take a bus up the mountain to Machu Picchu. This option is very expensive (starting at $70USD one way!). Machu Picchu entrance tickets are already very pricy so decided against this option. 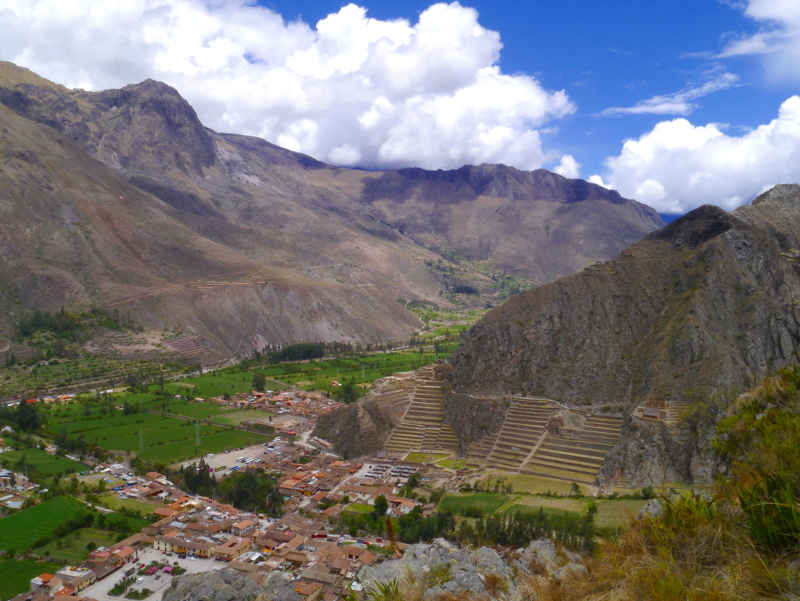 Jungle Route – Take public transport from Ollantaytambo to Santa Maria, take a collectivo to Santa Teresa, take another collective to the Hydroelectric Station, and then walk along the railroad tracks for 2 hours. A more circuitous route, but a much cheaper (and adventurous?) option. This is what we set out to do! There are other options, like hike along the railroad tracks from Ollantaytambo to Aguas Caliente, but it is a 6-8 hour hike and I hear the path is pretty sketchy, so this is not for the faint of heart. More adventurous than we wanted to be. The French traveler we met raved about the Sacred Valley and about the lovely experience he had in Maras. We were excited to spend a couple days in this sleepy little town and enjoy the scenery of the valley. 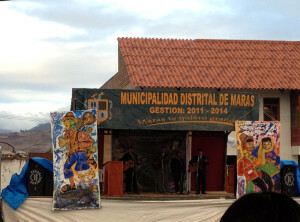 Many tourists go through Maras (pop. ~800) as part of a tour headed to the nearby ruins, but this small, agricultural town shuts down at sunset and only has 1 official hostel. The Frenchman raved about his experience in a non-advertised hostel so we kept asking around for places to stay and for a found ourselves crashing a birthday party. Her extended family was gathered preparing cuy (guinea pig), cuy sausage (using the intestines), and other specialties for her mother’s 83rd birthday. A little skeptical, but we were open to trying something different. When she finally took us to the hospedaje next door, Matt noticed a pool of fresh blood next to the shower. Cuy blood? I hadn’t noticed and thought it was just general farm smell (sheep, mules, pigs, you-name-it walk through the streets). Matt was shocked I hadn’t noticed the rotten blood smell (“This is not normal farm smell!” How was I to know?). We took this in stride and went on a walk up the hill outside town. We headed back when it started raining and stumbled upon a district-wide performance. Singing, dancing, poetry, covered seating AND they were handing out hot chocolate and crackers to the crowd. Maras was looking good. However, we discovered no tourists = no dinner restaurants. As we asked around for a place to eat, a man offered to call his mother to fire up the kitchen for us. Finally we found that the only bar in town served food. We were told that everyone goes to bed early, as they work in the fields at the crack of down. Unfortunately, that did not include our “hostel” owner. It sounded like a MSG concert going on next door until almost 3 in the morning. It was the worst night sleep we had – worse than our mosquito-y hammock experience in Colombia. Matt couldn’t bear the thought of another night in Maras. As much as we wanted to fall in love with it, we just had to cut that trip short and we hiked to the nearby Salineras. 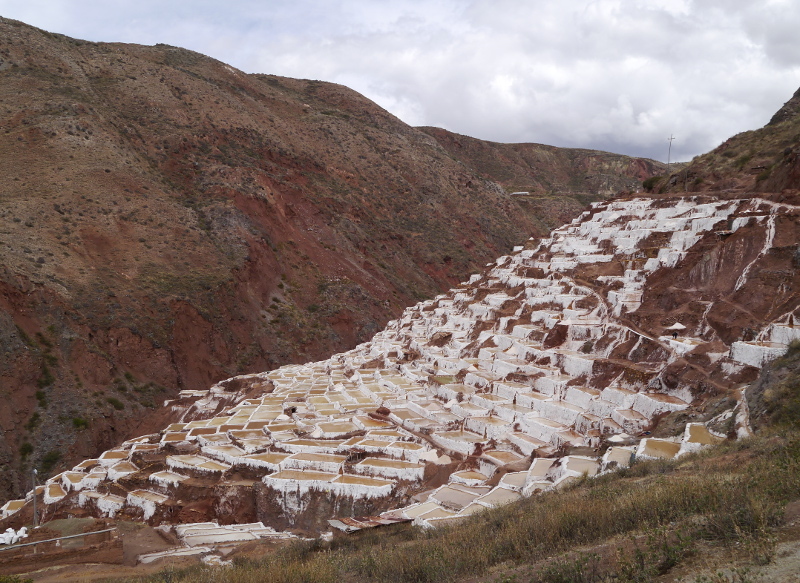 Salineras is an Incan salt mine that is still being used today. We continued our hike through the valley, across the Urabamba River onto the main road to catch a combi to Ollantaytambo. 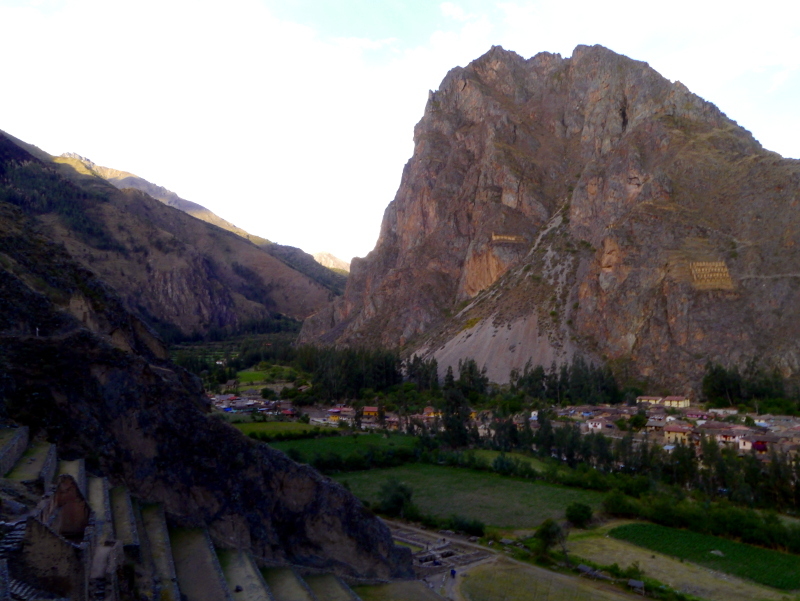 Ollantaytambo was a smaller but nicer version of Cusco. The town itself sits in a valley surrounded by Incan ruins. Many of the town’s buildings have original Incan foundation and have been continuously inhabited since the Incan times. We got a tip from a local for a secret (and free!) 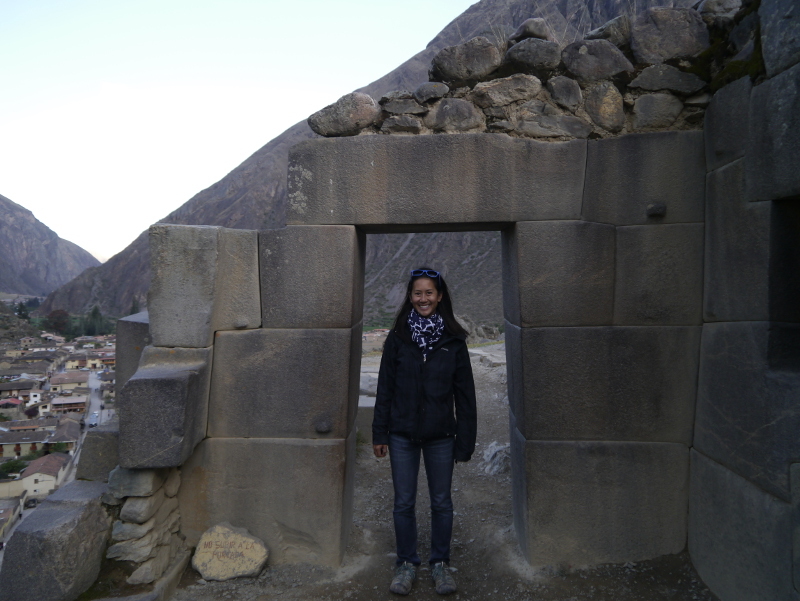 entrance to the nearby ruins (Temple Hill – regular 70 sole admission) and enjoyed the afternoon admiring the Incan architecture. Matt couldn’t get over the extremely detailed construction – the huge rocks were carved to fit together perfectly. The next morning, we hiked up the other side of the valley to Pinkullyuna before waiting for transportation to Santa Maria. Each person we asked gave a different time for the bus – 12noon, 1PM, 2PM, 2:30PM? Who knew what time it would come? We ended up waiting on the main square for 2.5 hours. I briefly chatted with a local Quechan man who also mentioned he was headed that direction. When Matt saw him make moves towards a white van, we jumped at the opportunity (who knows, it could have been another 2 hours before a bus showed). After we got in the van, two baby lambs boarded! 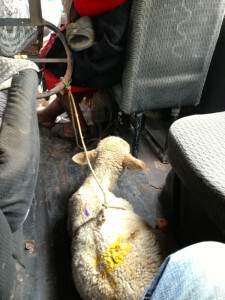 We spent the better part of our 4-hour journey with ba’s, soft wool to pet, and some other less desirable “farm smells”. The road is crazy windy, through water crossings and next to steep, hundred feet drop offs. I tried not to look. Matt and I weren’t sure if we’ll be able to make it to Santa Teresa (another hour) as it was now dark, but just as we arrive to SM there was a collectivo waiting. Again, I try not to look as we drive down a crazy windy dirt road with steep drop offs but thankfully we arrive to Santa Teresa safely (we had heard of a tragic event earlier that week where a cargo bus filled with locals fell off that same road killing 60 people) . At dawn, we walk to these amazing hot baths – if you ever find yourself in Santa Teresa, these are a must! The mountains are gorgeous and the baths are extremely clean and well-kept. Later that morning, we find a collective to take us to the hydroelectric plant. We are dropped off at the end of the railroad tracks and start our trek in. 5 minutes in, I strike up a conversation with a man headed the same way. His name is Victor, and he was born along these railroad tracks. He has worked in Machu Picchu the past 33 years doing odd jobs. We walk along for another 20 minutes and he is chatting up every person along the way. We reach a bridge and we meet his son and grandsons. Right after the bridge, Victor tells us to look up – it’s the backside of Machu Picchu! We walk another 100 feet and he invites us into his house. 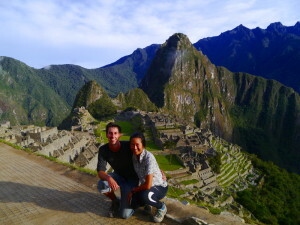 Victor was born literally in the shadows of Machu Picchu! 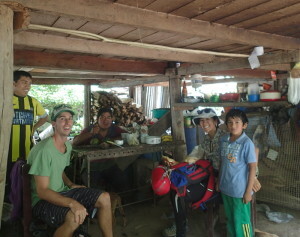 Sharing avocado sandwiches with Victor and his family literally in the shadow of Machu Picchu. 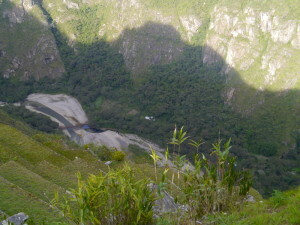 Taken from the ruins in Machu Picchu – you can see Victor’s house down below! We walk through banana trees, a pumpkin patch and avocado trees to his house. He gives us an avocado and bananas from his plants – I only had bread to offer, so I make sandwiches for the three of us and his grandson. Victor’s son comes by brings out some roasted corn kernels and strawberry soda. Victor lets us know that he had a beer with lunch so he is extra talkative today. He places a big wad of coca leaves into his bottom lip and begins to chain smoke. We talk about how the industry of Machu Picchu has changed during his life, his 6 children, the travelers he’s met (including a couple from Uruguay who stayed with him 2 nights), and the US/China. An hour and a half pass, and we take a last look at the tourists and ruins on top of Machu Picchu from his backyard before continuing our journey to Aguas Caliente. There is plenty of space to walk next to the train (which don’t come that often and give you much advance warning when they do) so it was an easy hour and a half more to Aguas Caliente. 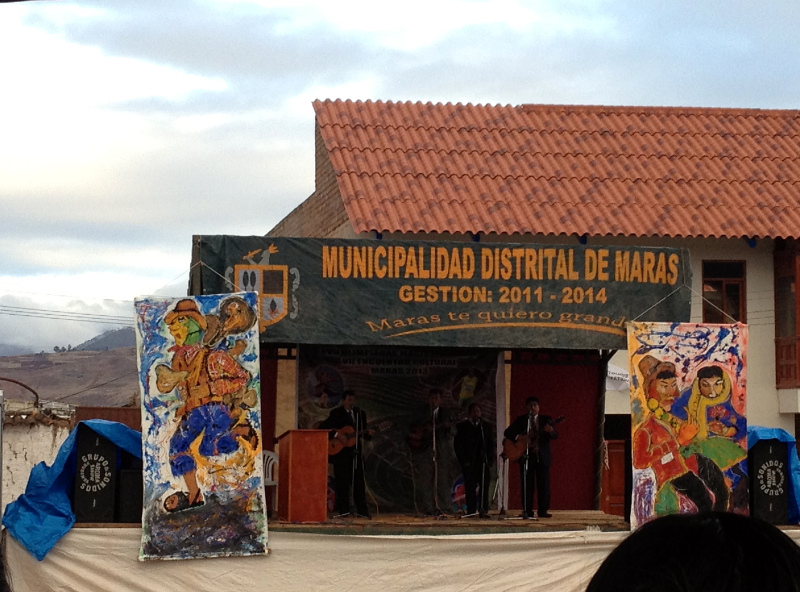 If we thought Cusco was touristy, Aguas was several times more so. We tried to venture out a bit and ate dinner facing the park where the locals played soccer and volleyball. Our hostel in Cusco had given us a recommendation for a hostel in Aguas Caliente. Our hostel was in a building next to both the train tracks and river, and was actually below another hostel. We spent the night in what we now refer to as the hammock bed. If only we had taken photos of every place we’d slept this year! Matt later told me that he killed a flea right before going to bed but decided he would wait to tell me, knowing that it would have kept me up all night. We woke up at dark-and-early 4:30AM to begin the climb up to Machu Picchu. From Aguas Caliente to the entrance was about 20 minutes, and then it was a 50-minute non-stop stairmaster straight up to Machu Picchu. We arrived fairly early (for reference: a couple who claimed to be one of the first 10 people in woke up before 4AM) and got to enjoy the sunrise. Usually it is cloudy until around 11AM, but we were lucky and it was clear skies. It was stunning to see the glaciers in the distance in contrast to the jungle-y, thick brush in Machu Picchu. The luckiest llamas of Peru live in Machu Picchu, keeping the lawns freshly mowed. We wander around for a couple hours before heading back down the mountain and making the trek back along the railroad tracks. We’ve heard there is a bus from Santa Maria to Cusco leaving in the afternoon, but again the quoted times are all different. If we don’t catch the direct bus, we would have to make several connections, so we’re prepared to spend the night in in Santa Teresa/Santa Maria/Ollantaytambo if needed. Fortunately for us, the timing works out perfectly – hiking to hydro, hydro to Santa Teresa, Santa Teresa to Santa Maria, and I am grabbing our lunch to go as the bus to Cusco is honking for us to get on. We get dropped off in a random part of Cusco, but fortunately there is a nice local who also happened to be headed in our same direction. 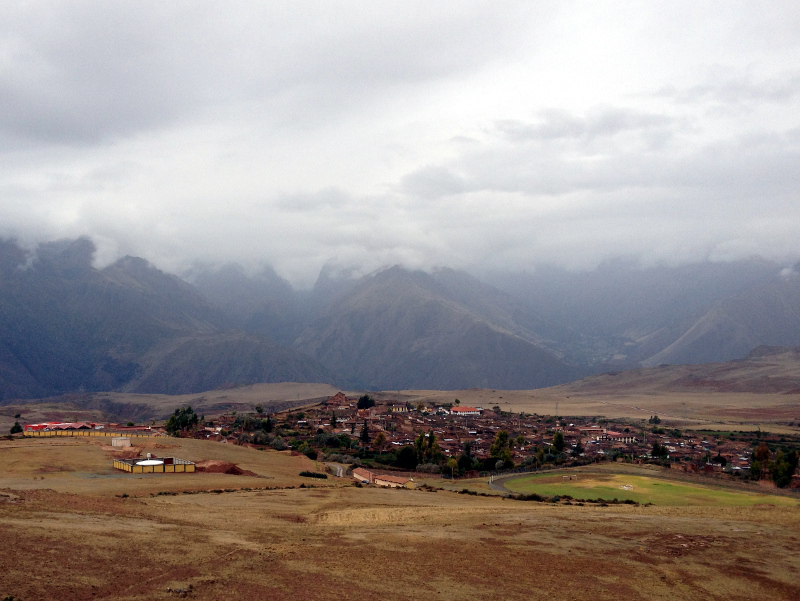 The next morning, Matt and I hiked up the hill towards Saqsaywaman. The sky is threatening to rain, so there were no guards (one more free entrance for the road! ).